If you could manage your own project, save money and get the design you want; wouldn't you? This program will lead you step by step through this difficult process. DO NOT START YOURS WITHOUT IT! As I am sure, you have read and heard all the horror stories about unsuspecting homeowners being taken advantage of by unscrupulous contractors and loosing their hard earned money. These statistics give all contractors a bad reputation. Ironically, there are more good honest contractors than bad ones. Will you hire the right contractor for your home improvement project? Will you know the difference? The 10 chapters in this unique e-book will show you how to make the critical decisions that will have long-term implications on your project. This program will lead you every step of the way. It can be read cover to cover, or used as a guide and skip to the chapter you need most. Here is a small sample of what you will learn from reading this book. This eBook will give you a major advantage; you will become a successful manager of you own project and get the final design you desire on time and budget. This eBook offers concrete advice from a professional with over 25 years experience. Not only do I recommend this book to my clients, but also I often refer to it myself to fully understand from a homeowner’s point of view exactly what they can expect as they embark on the difficult task of renovating a home. Tammy Borges has “hit the nail on the head” with this great resource for homeowner’s and design professionals alike! If you purchase one remodeling book this year; this should be it. You will follow the same systematic approach and process that I have learned and employed for over the past 25 years. This e-book is chock full of tips, strategies and techniques that I have used to make all my projects consistently successful. This compact easy read takes you right to the heart of each phase with straightforward information and answers. Get my information-packed eBook now! 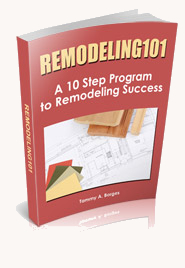 Learn all you need to know about the remodeling process with this easy systematic program. Each chapter is packed with critical information required for success. Save money and avoid the common pitfalls that befall the uninformed. Thank you for providing this informative guide. I have used it on my first remodel and was able to see situations developing before they became a problem. The book provided much more information than I thought I was getting. I will highly recommend it to friends and family. If you are serious about understanding how the remodeling process works and how you can save money by not making the typical mistakes, then get this eBook now! I read your book at the weekend and thoroughly enjoyed reading it because several times when I came upon items of information I was reminded of situations that I have experienced in the past where I thought "If only my client had taken that precaution" or "now that would have prevented that problem on such and such a project". Your book brought a few memories back to me. I found the book to be hugely informative, full of relevant information presented in a clear no nonsense fashion and easy to access. From advice on how to prepare your home for coping during the project, to the right questions to ask prospective contractors and interpreting their responses, even down to recognizing nuances in their body language, how and when to use professionals i.e. architects and interior designers etc, project management and budget control, it's all in this book. An absolute must for anyone planning a home remodel or even, I would suggest, a new home build. The 10 Step Program eBook is an easy download. PayPal is used as a secure authorized billing agent for your safety. You place your order with PayPal, who will validate your credit card. Upon successful payment, you will be returned to a special page on this site to make the download of The 10 Step Program to Remodeling Success eBook as well as Bonuses numbers 2 & 3. The eBook is a PDF file, approx. 818 kb, and downloading time may vary depending upon your computer's internet connection. Within a few seconds after payment, you can start reading and discovering the right steps required to make your remodeling project a success story while saving money. You have nothing to lose on this deal. To get your own personal copy, click the button below. Order this must have guide today for only $17.00. It can save you thousands of dollars during the lifecycle of your project. It can save you thousands of dollars during the lifecycle of your project. Have questions? Please contact our Sales Department.